This paper uses techniques from two domains: bibliometrics and knowledge management. It presents a reference ontology for "knowledge domain analytics" and defines inference rules for this ontology using two key relationships (polarity and strength). 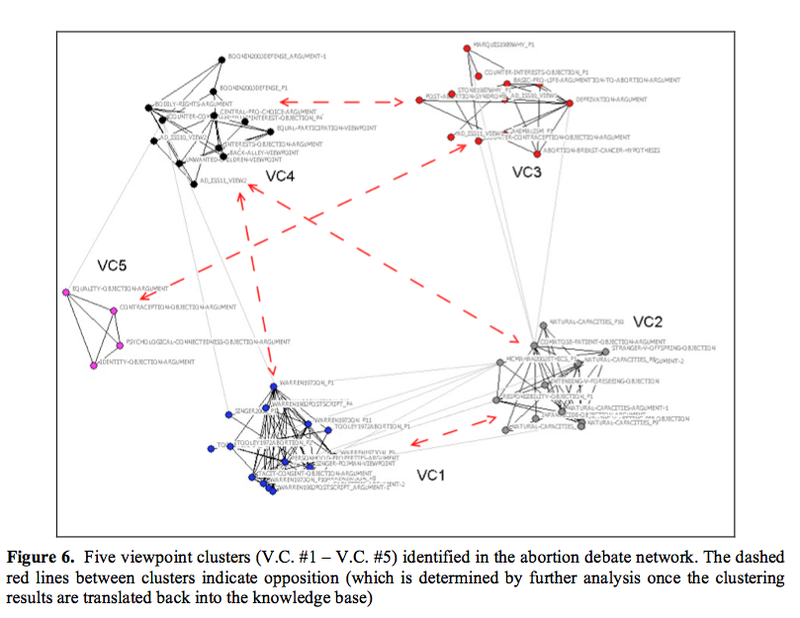 That background is used to cluster information manually extracted from Wikipedia's article about the abortion debate, revealing some additional information. The Core KDA ontology specializes SemODP. SemODP Semiotic Ontology Design Pattern http://www.loa-cnr.it/ontologies/cDnS.owl (Behrendt, W., et al. Towards an ontology-based distributed architecture for paid content. in The Semantic Web: Research and Applications, 2nd European Semantic Web Conference (ESWC 2005). 2005. Heraklion, Crete, Greece: Springer-Verlag. ) is constructed as a reference ontology for "knowledge domain analytics", which includes both quantitative and qualitative analysis, and has 3 classes. Here are the correspondences between Core KDA (mkda) and SemODP (cdns). Table 1 provides a crosswalk to 4 ontologies (used by various tools): swrc (Bibster), eskimo (ESKIMO), scholonto (ClaiMaker), and akt (CS AKTIVE SPACE). The authors also make explicit their assumption that knowledge representation and communication are major activities, and semiotic ones. These rules are then used for a case study. Wikipedia's article on Abortion Debate is used to populate a knowledge base with Issues. The underlying propositions and arguments are further added. Then information about publications and authors is coded. With the knowledge base populated, the inference rules are used; this "results in a network representation with a single +ADDITIVE link type", which is appropriate input for bibliometrics. Then Netdraw software is used to cluster and visualise the positions: As noted, the goal is "to detect interesting phenomena that will motivate more focussed investigation on the part of the analyst." The analyst determines who is associated with each cluster, which is used to determine "opposing" clusters (clusters were at least half the viewpoints have a 'disputes' relation with the viewpoints in the other cluster."). Those opposing clusters are shown as red dashed lines in the figure. Viewpoint clusters add value by reducing the complexity and by adding information (for example, the authors find that Jeff McMahan is associated with two clusters which oppose each other). In addition to its theoretical value, this paper may be useful for students trying to understand the many perspectives on the abortion debate (see especially Table 2 which summarizes viewpoints and authors). Distinguishes micro-argumentation and macro-argumentation -- which could be helpful elsewhere. This page was last modified on 27 March 2012, at 13:14.